Artwork is like a really nice pair of sunglasses. You need a little bit of flair; a little bit of personality. Something that’ll stand you out from the crowd. Artwork, in other words, is menswear for your home. Your point of view, perfected. So, on the occasion of the return of the LA Art Show and Art Los Angeles Contemporary, we’ve selected the 8 Galleries Every Man Should Know. 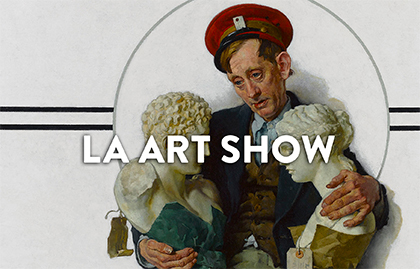 The LA Art Show, now in its 20th and biggest year, starts next week. On display: works from 120 galleries, which deal in everything from Van Gogh to local artists like JT Burke, who’s erecting a 16-foot tent full of carny art. ALAC, set for the end of January, takes place in the Barker Hangar in Santa Monica. The show grants you access to the homes of big collectors and into the studios of various artists. And so, these are the 8 exhibiting galleries you should know. Find yourself some artwork, friend.